This particular pocketknife is the "Trapper" model, from renowned W.R. Case & Sons Cutlery Company. It contains two different blades: a clip blade and a spey blade. 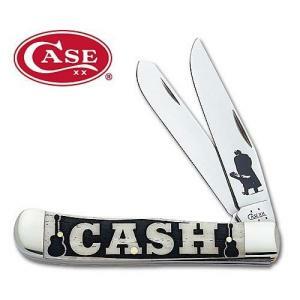 The clip blade has the collectible embellished Johnny Cash logo, and Cash's guitar is proudly displayed on the handle, along with Long Tail C serialization. The blades are crafted from strong Tru-Sharp surgical steel, brilliantly polished for optimal display value. Its handle is smoothed out of black synthetic materials. When closed, the knife measures 4.175 inches. This set comes in a collectible display case honoring "The Man In Black" with a genuine Case collectible medallion. Overall, it's a noble and traditional way to honor Johnny Cash's legacy.